Apparently Zoey loves the rescue rake. She let me brush her for a very long time today, even got those tail feathers brushed out! I wasn’t sure how she would react after she ran and hid under the bed the first time I tried the FURminator on her. I returned it to Petco the very same day. So thank you, it’s a hit!! And I really liked how it felt holding it and brushing her. I think the weight is perfect, nice and solid. I’ve been using Rescue Rake for a few months now and when it’s quiet, I can actually hear the difference in sound of the Rescue Rake grabbing dead coat and going thru live coat. If I don’t hear any dead coat, and don’t pick up any debris, we’re done in a few minutes and have plenty of time to play before I get ready for work. And I gave my FURminator to my friend who has Labs. I thought my cheap wooden handle rake with short and long teeth was doing an OK job. And I’d never spend that kind of money on the FURminator when it only does one thing. But then I saw how much deeper into the coat the RescueRake was able to reach. I couldn’t believe all the debris my rake was missing while I thought I was taking good care of my dogs. Lola likes it so much she fell asleep”. ​I let my coworker take it home to try it and he said it is the first grooming tool his dog didn’t run away​ ​ from when she saw it. ​All my dogs ran and played “catch me if can” when I took out the FURminator, but just the opposite happened with the Rescue Rake. Our oldest dog Renny has to be first in line whenever I pick up the Rescue Rake.. But he also doesn’t want to miss any of action that’s going on while he’s getting raked. He has solved this problem by sitting between my legs with his back to me so I can rake his back while he swats the other dogs as they chase each other in front of him. Frankly, I don’t know how I would be able to manage the coats of my two Kuvs without it. I tried every bloody product on the market: the best did a fairly decent job but usually at the expense either of the look of the coat or pain to the dog. And after a few month’s hard use, other combs and brushes started losing teeth which made them all but useless. Arpad has thick coarse hair which is just a straightforward arm-aching job. Normally, it was taking me about 45 minutes of horror. With the Rescue Rake —and I kid you not-I can give him a thorough going over in less than 15 minutes and he actually rolls over with pleasure when he sees me coming rake in hand. Not bad for a boy Kuv that looks like he’s carrying half the ravine in his hair. Maya has very thick curly hair that is really fine. This hair mats like crazy especially if it showers or rains and she loves the rain. And she is never out of mud and weeds. 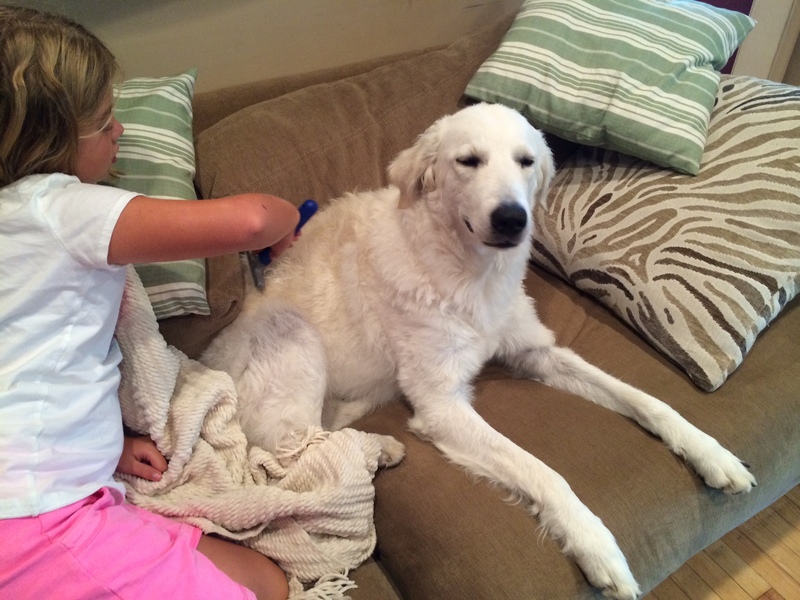 Unlike Arpad, she has to be brushed every second day in the summer or I’d be cutting half her hair out. She’s stoic but even Maya wouldn’t be able to manage the brushing needed to keep that coat tangle free without the Rescue Rake. Before, I was doing her in about three 45 minute sessions because we both were on the brink of collapse after the first round. Now I can do her completely and thoroughly in about 45-50 minutes. That’s a huge difference. I don’t know what the secret of the RescueRake is but I do know what it does—my muscles have weakened due to the autoimmune illness I have and the Rake helps me groom without tearing my muscles further. From my dogs point of view, this is not a torture instrument like every other grooming comb or brush but something that ranges from fun to perfectly tolerable. I don’t have to hide the RR in my pocket and sneak up on them. I don’t know what it’s like with other dogs but I’ll bet any owner that has a long haired or shaggy dog could make his own and his dog’s life a helluva lot better with this tool. And, special bonus, it doesn’t loose teeth like the other ones after a hard year’s work. Nor do the teeth bend —this is key—so you get more than your money’s worth. I thought it was on the expensive side but actually it’s turned out to be cheaper because I don’t have to replace it. You get what you pay for!!!! As the lady said. We have 4 Maremma LGDs and the RescueRake is the ONLY thing that works! They will sleep through their grooming sessions and compete with each other to go “first” when I sit down in their paddock with the rake. I’ve even used it on lambs to get some of the longer hay out of their wool. I love the rake. With a Leonberger and a GSDxcollie cross I have a lot of hair and coat to deal with. I do a weekly brush and nails (in a addition to scheduled baths and full grooms) and while I do still use other tools, the majority of the brushing is so much easier when I start with the rescue rake. Since I have carpal tunnel and thumb tendonitis I wanted you to know that this rake provides a lot of relief to my hands. But this “real report” is not about the dogs, it is about one of my rescue cats. Emmitt was born to a pregnant feral that I took in several years ago. The plan was to save the kittens, s/n and find homes. (The mother tamed down real quick so she too was given a new home) Emmitt just never found the right home so stayed permanently. Emmitt has a long thick coat that is very wooly in texture. It is a very hard coat to keep so he is typically shaved down twice a year (he is an indoor cat). Emmitt hates brushing and does not keep his own coat well. Brushing a cat that hates brushing is never a happy experience and one that it is likely to leave you with battle scars. While using the rescue rake on the GSD x collie, Emmitt wandered up and made it clear that he wanted attention too. Without thinking I just swiped him down the back with the rescue rake (his coat at this point is about 1.5″ long and not the horrible mass it turns into when fully grown out). Emmitt purred and arched his back for more. I ended up “brushing” him out and have been using the rescue rake on him weekly since. His coat is now about 2″ long and looks awesome. He enjoys most of the experience and I am delighted. I always thought it was odd that Emmitt was not like most cats in that he loved being shaved down. I now understand that he preferred the shorter coat because he could “feel” pets that he could not feel with a full coat. With the rescue rake, I can get to the skin and Emmitt just thinks he is getting special pets. 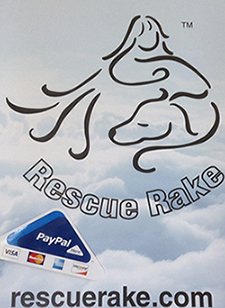 My Rescue Rake arrived yesterday. It has been used on both of my Great Pyrs and my Bearded Collie (with a coat that is about 4 ” long.) 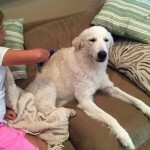 The results were excellent and all the dogs did better than they have with any previous grooming tool. The proof is in the pile (of dog hair) and a smiling dog still sitting there! Just got my RescueRake in the mail today, I couldn’t wait to try it on Koda our Great Pyrenees. It is amazing how much more hair came off and he definitely likes this one much better than any other comb or brush I have tried.